American race car driver Dale Earnhardt, Sr. was one of NASCAR’s renowned racers and is especially noted for his success in NASCAR’s top racing Winston Cup Series, now known as the Sprint Cup Series, winning seventy-six races (including one Daytona 500 victory in 1998). Earnhardt’s aggressiveness on the race tracks earned him the reputation of being a reckless driver. He was branded as “The Intimidator”, among other nicknames that spoke to his controversial style. 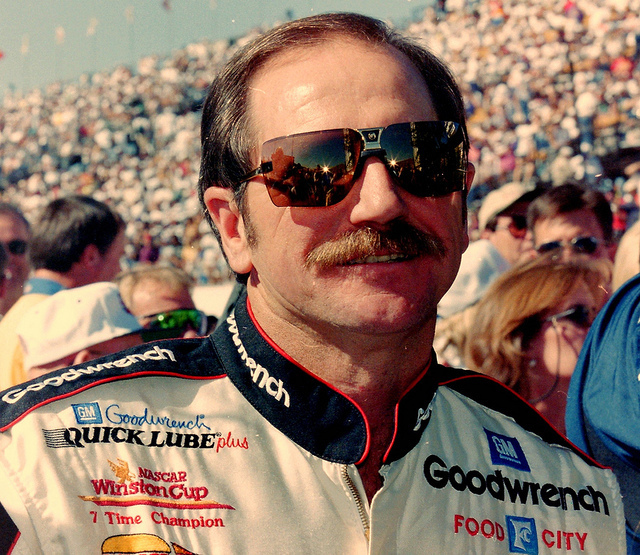 When NASCAR’s president intervened in 1987, Earnhardt reverted to being less competitive building stronger ties with his fellow NASCAR drivers. Dale Earnhardt was born April 29, 1951 in Kannapolis, North Carolina, to Martha Coleman and Ralph Earnhardt. Earnhardt knew from an early age that he wanted to follow in his father’s footsteps and pursue his love for racing cars. Ralph Earnhardt participated in Stock car events and won the NASCAR Sportsman Championship in 1956; he passed away in 1973. After his father’s death Earnhardt continued to compete on the Sportsman circuit. Earnhardt got married at the age of seventeen and his wife, Latane Brown bore his first son Kerry, in 1969. He remarried and was given a second and third child, his daughter Kelley and son Dale Earnhardt Jr. With a second divorce Earnhardt’s final marriage was to Teresa Houston in 1982. Together, the couple had a daughter Taylor in 1988. Two years after his father died Earnhardt began his Winston Cup career in May 1975, debuting at the World 600 at Charlotte Motor Speedway where he placed 22nd in the race. In 1978, Earnhardt’s racing caught the attention of racing sponsor Rod Osterlund, and in 1979 he signed a full-time Winston Cup contract as Osterlund’s only sponsored driver. In his rookie season, Earnhardt won his first race in NASCAR’s Southeastern 500 in Bristol, Tennessee. He captured four poles, finished in the Top 5 eleven times, finished in the Top 10 seventeen times, and finished 7th in the points standings, becoming the first driver to win over $200,000 in his rookie year. He was awarded with NASCAR’s “Rookie of the Year” honors and in the following year won the Winston Cup Championship. In 1981 Earnhardt joined Richard Childress Racing, and finished the season 7th in the point’s standings. The following year he joined car owner Bud Moore for the 1982 season but had a disappointing finish of 12th in the points standing. In 1983, Earnhardt rebounded and won his first of twelve Twin 125 Daytona 500 qualifying races. Earnhardt won at Nashville and at Talladega, finishing eighth in the points standings. Between 1984 and 1985, Earnhardt had six wins and the 1986 season brought his second Winston Cup Championship. He won five races and had ten Top 5 and sixteen Top 10 finishes. Earnhardt successfully defended his championship the following year, setting a NASCAR record of four consecutive wins, and winning five of the first seven races. The 1988 season saw Earnhardt joining GM Goodwrench, and finishing third in the points standings behind Bill Elliott and Rusty Wallace. Earnhardt lost the 1989 championship despite five wins. His success on the track continued, as he won his fourth Winston Cup Championship in 1990, the fifth in 1991, and the sixth in 1993. The seventh Winston Cup Championship was won in 1994 and Earnhardt was now tied with the legendary Richard Petty in career title; at this point he dominated stock car racing. In 1996, he became the first driver to start in 500 consecutive Winston Cup races but was eluded by the eighth Winston Cup Championship when he had a frightening crash on the tracks. Earnhardt won the Daytona 500 race in 1998, and finished 7th in the standings in 1999. In 2001 the world lost their beloved NASCAR driver at Turn 4 at the end of the Daytona 500.